LW Herndon writes urban fantasy and lives in Maryland without the aid of magic, mages, or demons. 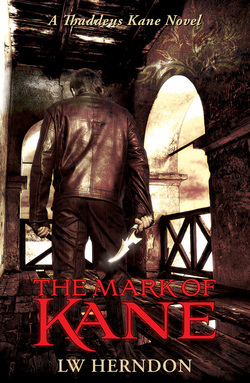 The Mark of Kane is the first in the Thaddeus Kane series. Human sorcerers bent on power are disrupting the underworld with demonic possessions and L.A. with murders. Half-demon half-human, Thaddeus Kane is the bloodhound for his clan, charged with finding the sorcerers and destroying them. His personal rules have always been clear—save his clan, protect innocents, and survive. Solicited for help by a demon from another clan, Kane’s first instinct is to blow her off. Until she dangles his one weakness beneath his nose—a mortal threat to prophetic children. Loyalties stretched in his race to find pre-emerging Irins and wizards, Kane struggles to ward off the danger to his clan. His previously harried, but manageable, life now swirls with secrets, until one fatal shot changes everything he believed about his past, turning the table on enemies and allies alike.